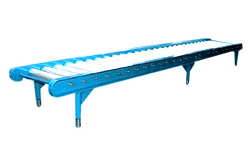 We are amongst the prestigious roller conveyor manufacturers and exporters. These precision designed roller conveyors are appreciated for their attributes of durability, strudy construction, rust resistance and simple operation. 100 lbs capacity per linear ft (level). 28 1/2" to 37 1/4" adjustable conveyor height 18", 24" and 30" conveyor widths.